EM Nevada Program groundwater characterization activities involve participation of many partner organizations, including Nevada Division of Environmental Protection (NDEP), United States Geological Survey, and national laboratories such as Lawrence Livermore National Laboratory. 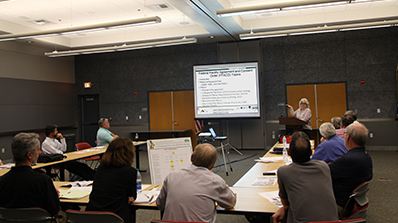 Above, NDEP Bureau of Federal Facilities Chief Christine Andres reviews the FFACO regulatory strategy with the Rainier Mesa and Shoshone Mountain external peer review panel. 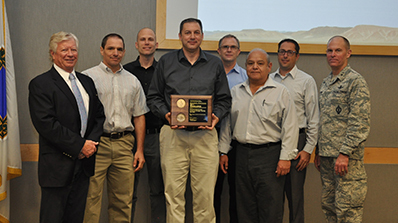 Scientists in the Environmental Management (EM) Nevada Program continue to make progress in groundwater characterization, which contributes to the EM mission of protecting human health and the environment from the effects of historic underground nuclear testing at the Nevada National Security Site (NNSS). Studies at Rainier Mesa and Shoshone Mountain on the NNSS have shown minimal movement of contaminants away from the nuclear test sites, and these findings will be reviewed by a panel of independent experts in an important step toward long-term monitoring. Long-term monitoring is the final phase outlined in Federal Facility Agreement & Consent Order (FFACO), an agreement between the Department of Energy (DOE) and the State of Nevada that outlines a schedule of commitments for remediating sites contaminated by historic nuclear testing. Long-term monitoring at the NNSS will ensure the public water supply is safe in perpetuity. For groundwater characterization purposes, the NNSS is divided into several regions according to common attributes, such as geology and location. Characterization of these areas involves investigating the subsurface environment, creating computer models using data collected from groundwater well sampling, and measuring contaminant levels and movement within the groundwater. Once investigations have led to a comprehensive understanding of the subsurface, the supporting data for each groundwater characterization area undergoes an external peer review, in which a group of independent experts will review and evaluate whether the work being done is both scientifically accurate and ensures that it is protective of human health and the environment. 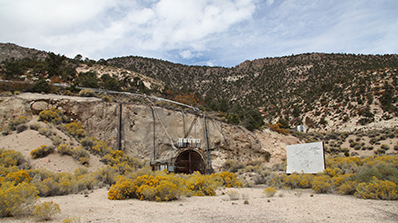 A unique aspect of the Rainier Mesa and Shoshone Mountain areas is that all but two of the underground nuclear tests were performed in horizontal tunnels carved into the face of a mountain, rather than the vertical shafts used for testing in other areas. “N Tunnel” portal on Rainier Mesa is pictured above. In the northern part of the NNSS, Rainier Mesa and Shoshone Mountain make up one such area. After studies and characterization were completed for Rainier Mesa and Shoshone Mountain, NDEP reviewed and concurred on the sufficiency of data. This paved the way for the external peer review process which began in October. Once the external peer review validates EM Nevada Program findings, the area will enter into long-term monitoring. 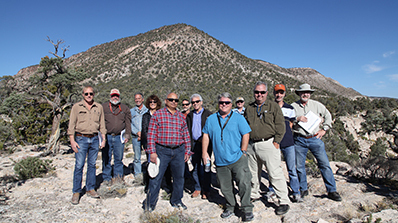 The peer review panel that will be evaluating EM Nevada Program’s work at Rainier Mesa and Shoshone Mountain consists of four experts selected from a pool of 22 qualified applicants. The peer reviewers have backgrounds in geology, hydrogeology, and environmental cleanup and regulation. Together, they have the extensive experience and knowledge required to thoroughly examine the technical reports written by EM Nevada Program scientists, while bringing an important outside perspective to the project. Beginning in January 2018, the peer reviewers will review the associated modeling reports, as well as background information on activities conducted since the EM Nevada Program began characterizing the area in 1991. The panel will meet with EM Nevada Program scientists and managers several times as they perform their review and are anticipated to provide a final report of their findings in June 2018. Once published to the DOE Office of Scientific and Technical Information, a link to the report will be made available to the public. 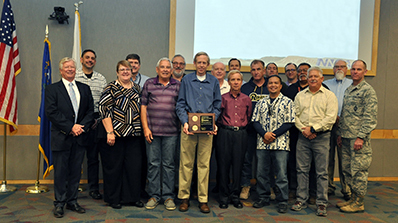 From left to right: Michael Barden, peer reviewer; Jeff Wurtz, Navarro; Joe Johnston, Navarro; Jane Hedges, peer reviewer; Sharad Kelkar, Navarro/HydroGeoLogic, Inc; Joe Fenelon, United States Geological Survey; Leonard Konikow, peer reviewer; Bill Wilborn, DOE; Ken Rehfeldt, Navarro; Andy Tompson, Lawrence Livermore National Laboratory; Chuck Russell, Desert Research Institute; Richard Waddell, peer reviewer. “The external peer review process is important because it provides an extra layer of validation as we move through the FFACO strategy. 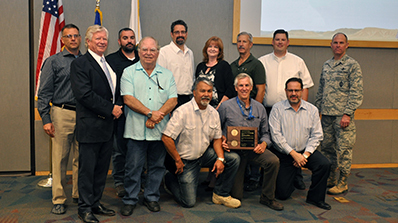 The panelists selected are extremely competent and knowledgeable in their fields, and will be an excellent resource for the EM Nevada Program as we move Rainier Mesa and Shoshone Mountain toward long-term monitoring,” said Bill Wilborn, Underground Test Area Activity Lead for the EM Nevada Program. 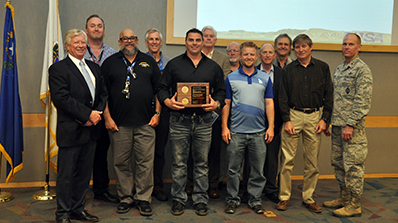 The peer review kicked off on October 17 with a meeting at the Frank H. Rogers Science and Technology Building, where EM Nevada Program scientists shared their latest findings. Over the next two days, the peer review panel toured the NNSS to get a first-hand view of the geology of the site. The peer reviewers were also shown the tunnels where tests had occurred, as they received briefings on the geology specific to the area and how the tunnel configuration may affect contaminant movement within the subsurface environment. The peer review process is a key step for ensuring public water supplies remain safe for generations to come. 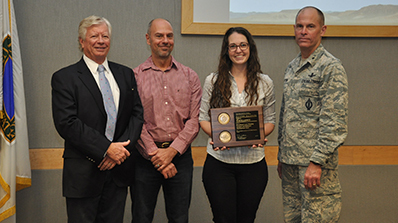 By using sound, defensible scientific studies, EM Nevada Program scientists and those in the external peer review panel are fulfilling the mission to protect the public and the environment from access to groundwater contaminated by historic underground nuclear testing. 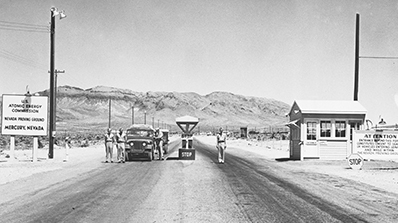 The entrance to the Nevada Proving Ground in the early 1950s. On Dec. 18, 1950, President Harry S. Truman signed an order establishing the Nevada Proving Ground as the nation’s on-continent nuclear weapons testing area. That place is now known as the Nevada National Security Site. At that time, the Atomic Energy Commission was looking for a “continental site for all atomic weapons tests.” On their wish list: an area remote enough where “detonations could be done safely and with minimum non-productive cost in time, effort and money…preferably within two to three months.” Also desirable: “ready accessibility to the Los Alamos Laboratory by land and air, good communications, adequate radiological safety, reasonably regular topography and prospects of economy of preparation and operation”—all for $1 million. The NNSS, 65 miles northwest of Las Vegas, was selected as the most desirable location for the reasons mentioned above; in addition, its mild weather and terrain were conducive for testing year round. “The Special Committee of the National Security Council on Atomic Energy recommends approval by the President of the development of a portion of the Las Vegas Bombing and Gunnery Range as an atomic weapons test site,” said the memorandum for the president. And so it was done. On Jan. 27, 1951, the NNSS conducted its first atmospheric experiment: Operation Ranger’s “Able,” a one-kiloton device dropped from an Air Force plane at Frenchman Flat. Read more about the Site's origins here. 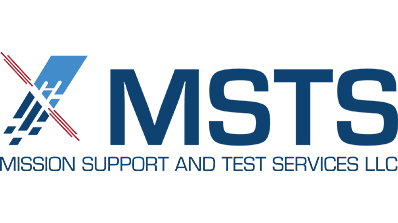 Mission Support and Test Services, LLC (MSTS) has officially taken over as the Management and Operating contractor of the 1,360-square-mile Nevada National Security Site (NNSS) – located 65 miles northwest of Las Vegas. 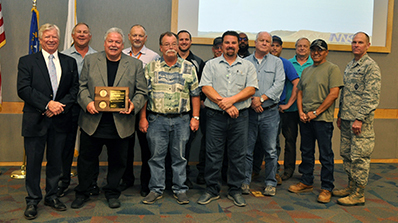 Awarded by the National Nuclear Security Administration (NNSA) in May, the MSTS Management and Operating contract began December 1. It is valued at $5 billion over 10 years if all options are exercised. Mark Martinez will serve as MSTS president, providing leadership and management direction for the effective and efficient execution of all operations at the NNSS. He will also lead development of a visionary and executable strategic plan. John Benner will serve as MSTS vice president. 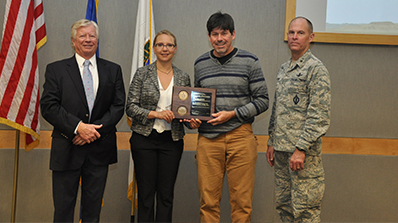 In his position, Benner will work to integrate NNSS operations across organizations to ensure safe, secure and consistent execution and strengthen external relationships with NNSS customers, including the National Laboratories. Additional MSTS leadership includes: David Feather, programs integration senior director; Ping Lee, NNSA program senior director; Mark Krauss, environmental management program director; Bart Jones, mission execution senior director; James Wallace, nuclear asset operations senior director; Fred Dohse, mission assurance senior director & nuclear safety officer; and Ray Alexander, mission support senior director. MSTS is a limited liability company consisting of Honeywell International Inc. (Honeywell), Jacobs Engineering Group Inc. (Jacobs), and Stoller Newport News Nuclear, Inc. (SN3). 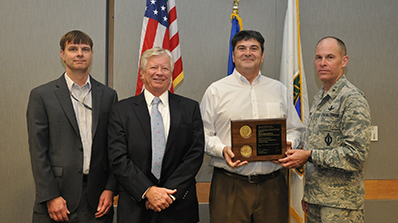 The company is dedicated to bringing a service and support approach to the mission of the NNSA and its labs and plants in the most cost-efficient and value-added manner. Martinez and his executive management team collectively hold roughly 300 years of leadership experience supporting national nuclear security. They come from parent companies Honeywell, Jacobs and SN3 with backgrounds at Lawrence Livermore National Laboratory, Los Alamos National Laboratory, the Kansas City National Security Campus, the Nevada National Security Site, the Pantex Plant, the Savannah River Site, and the U.K. Atomic Weapons Establishment..
MSTS staff collaborated closely with the former NNSS M&O contractor, National Security Technologies, LLC from Aug. 1 – Nov. 30 to ensure a smooth transition. 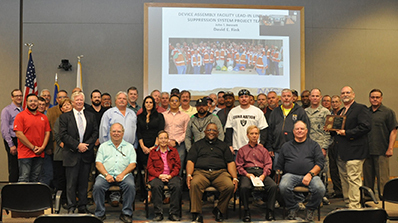 Within the NNSS contract, MSTS employs nearly 2,400 people across numerous facilities: Livermore Operations, New Mexico Operations, Remote Sensing Laboratory-Nellis Air Force Base, Remote Sensing Laboratory-Joint Base Andrews, Special Technologies Laboratory, North Las Vegas facility and the NNSS. The NNSS falls under the jurisdiction of the National Nuclear Security Administration, a semi-autonomous agency within the U.S. Department of Energy (DOE). The Site’s operations are government-controlled and contractor-operated. They are overseen by DOE’s Nevada Field Office, headquartered in North Las Vegas. 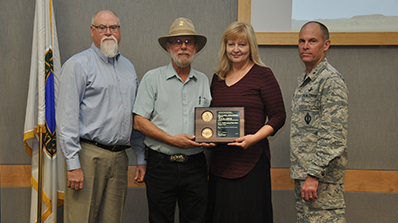 Dr. Kathy Opachich accepts the R&D 100 Award with (l-r) LO Manager Gene Hunt, Howard Bender and James Holt. 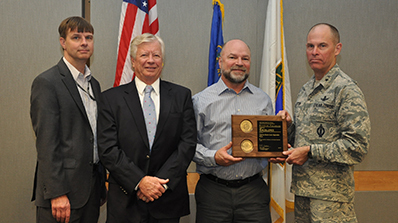 The Nevada National Security Site's Geometrically Enhanced Photocathode project was selected as a winner for this year’s 55th annual R&D 100 Awards, which took place Friday, Nov. 17, as part of the third annual R&D 100 Conference in Lake Buena Vista, Florida. The Geometrically Enhanced Photocathode project was led by Principal Scientist Dr. Kathy Opachich of the NNSS’ Livermore Operations (LO) in Livermore, California. 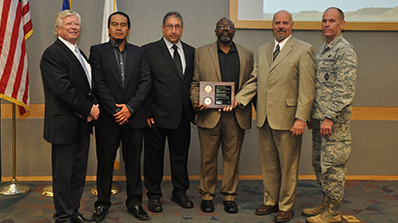 Opachich accepted the award along with NNSS Site Director James Holt. 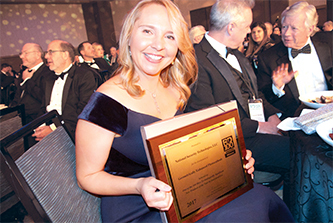 Long considered the most globally prestigious recognition of invention and innovation, the R&D 100 Awards honor the 100 most innovative technologies of the past year. This is NNSS’ fifth win since 2009. Additionally, one of the Site’s projects was a finalist in 2015. Opachich worked with LO colleagues and collaborators from Lawrence Livermore National Laboratory, Lawrence Berkeley National Laboratory, General Atomics and Nanoshift, LLC, to develop the recessed geometrically enhanced photocathode designed to improve high-energy efficiency in X-ray detectors. Dr. Opachich shows off the award. Scientific X-ray detectors are used to take snapshots of quickly changing phenomenon under extreme conditions that do not exist naturally on Earth. These detectors are designed to work at specific X-ray energies and need to be upgraded to collect good data outside of their working range. As part of the project, a structured cathode has been designed, fabricated and tested in an X-ray detector. The cathode was designed to improve images (make them sharper and brighter) without changing the accuracy of the data. The cathode was first modeled in computer software, then sent to Nanoshift to develop a fabrication recipe and make a prototype. The final cathode was tested in an actual X-ray detector to show that it improves the collected data without any compromise. The device can be changed to suit any X-ray detector and can be easily made and tested. “The geometrically enhanced photocathode proves that we can push the limits on what we can do in quantum efficiency—that is, improve our ability to see finer detail in the dynamics of fusion experiments than before. Not being able to do this previously is what has limited our progress. With this geometrically enhanced photocathode, we’re getting better and more data, and it lets us view the dynamics of fusion much more clearly,” said Howard Bender, distinguished scientist and Site-Directed Research and Development manager at the NNSS’ Los Alamos Operations in Los Alamos, New Mexico. Bender mentioned that the geometrically enhanced photocathode would be useful in other scientific research for probing states of matter, molecular dynamics, high-speed streak cameras and potential medical applications. 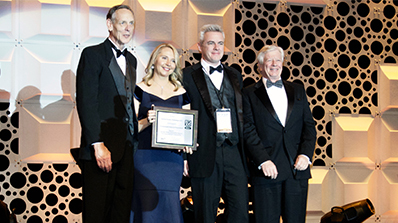 In addition to an R&D 100 Award, this innovation resulted in a full patent and several publications. The agency’s Space Technology Mission Directorate (STMD) has provided multi-year funding to the Kilopower project. 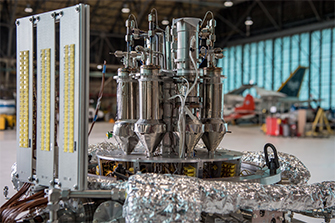 Testing is due to start in November and go through early next year, with NASA partnering with the Department of Energy’s (DOE) Nevada National Security Site to appraise fission power technologies. The NNSS will serve as host for the experiments. 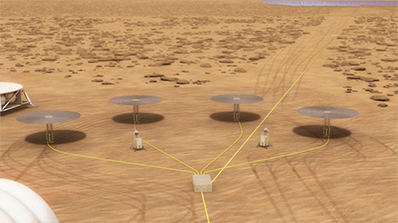 The pioneering Kilopower reactor represents a small and simple approach for long-duration, sun-independent electric power for space or extraterrestrial surfaces. Offering prolonged life and reliability, such technology could produce from one to 10 kilowatts of electrical power, continuously for 10 years or more, Mason points out. (The average U.S. household runs on about five kilowatts of power). The prototype power system uses a solid, cast uranium-235 reactor core, about the size of a paper towel roll. Reactor heat is transferred via passive sodium heat pipes, with that heat then converted to electricity by high-efficiency Stirling engines. A Stirling engine uses heat to create pressure forces that move a piston, which is coupled to an alternator to produce electricity, similar in some respects to an automobile engine. 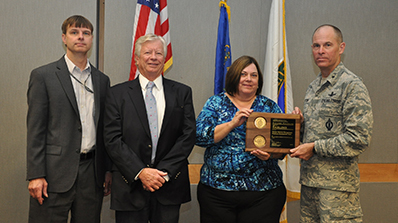 The National Nuclear Security Administration (NNSA) recently presented 17 Nevada National Security Site (NNSS) teams with Defense Programs Awards of Excellence. 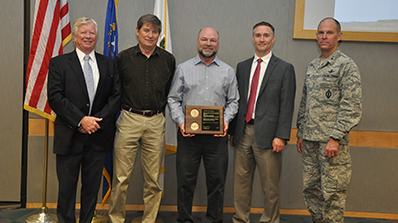 NNSA Principal Assistant Deputy Administrator for Military Application Brigadier General Michael Lutton was on hand to congratulate the teams for their excellent work in support of the nation’s Stockpile Stewardship Program. 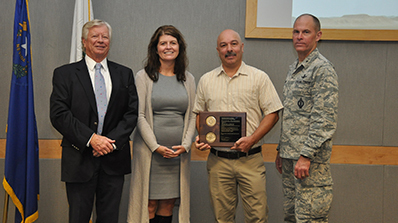 Made up of almost 300 federal, contractor and/or national laboratory personnel, the teams were recognized for their contributions to various Defense Programs projects, including advanced experimental diagnostics, nuclear material management, infrastructure investment planning and software development. 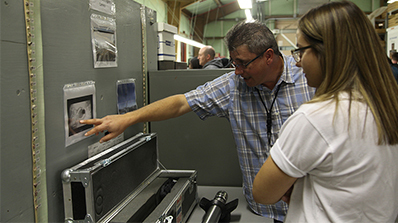 Several NNSS projects allow for higher-quality radiography and data analysis on subcritical experiments, a cornerstone of the nation’s Stockpile Stewardship Program. 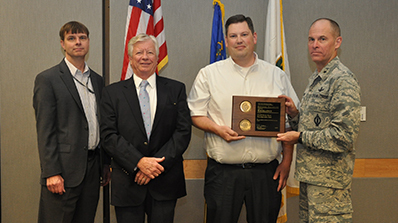 Established in 1982, the Defense Programs Awards of Excellence are given annually to recognize significant individual and team achievements in quality, productivity, cost savings, safety or creativity in support of NNSA’s nuclear weapons modernization program. 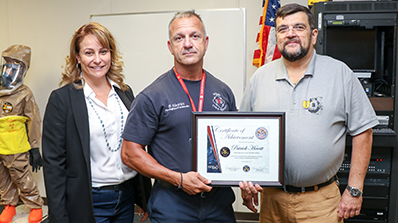 Rhonda Hopkins (left) and Raffi Papazian (right) present Patrick Hewitt with special recognition during the recent CTOS graduation ceremony. Immediately following the Oklahoma City bombing 22 years ago, first responders were overwhelmed with the amount of response needed. The National Domestic Preparedness Consortium was created soon after to ensure every potential act of terrorism in the United States would be addressed by training. 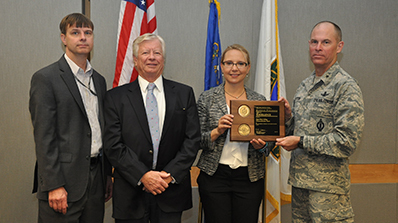 As a result, the Nevada National Security Site's Counter Terrorism Operations Support (CTOS) program was born. CTOS trains first responders from communities across the United States, and such training is necessary in this changing world. "We want first responders to be comfortable going into the scene instead of walking away from the scene," said NSTec Vice President for Program Integration Raffi Papazian. "This class gives them the comfort level through education and hands-on exercises in the environment we created." In 2017, CTOS has graduated its 200,000th student from its course, a major milestone for the program. "I could not be more proud today when we recognize how far we’ve come since our creation and now with our 200,000th student," said CTOS Manager Rhonda Hopkins during a recent CTOS graduation ceremony. Hewitt during the CTOS course. Patrick Hewitt, a driver from Wylie Fire and Rescue in Wylie, Texas, was the 200,000th student to graduate from the CTOS training course. Hewitt signed up for this course because he had limited knowledge of radiation and he knew it would be worthwhile to learn how to respond in that kind of situation. "I’ve been to several training opportunities and they [CTOS] are by far the most knowledgeable," said Hewitt. "It’s unlike any course I have ever been to." Hewitt, along with one other person from Wylie Fire and Rescue, attended the CTOS training course and are now able to take the knowledge back to their department. "It makes our responders safer as well as our community," he said. Check out the CTOS 200,000th student video made during Hewitt's time at the Site. The mission of the NNSS Global Security program is to ensure safety and security for the country, and the ultimate goal for CTOS is to train every first responder. 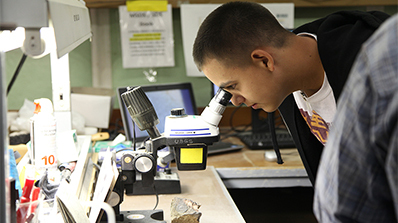 A student examines a geologic sample using a binocular microscope at one of the USGS Core Library visitor work stations. 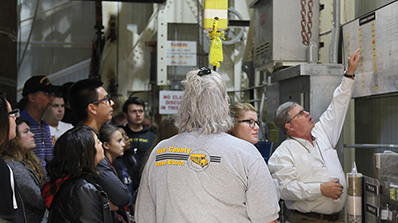 On Sept. 28, 47 students, teachers and staff from Pahrump Valley High School’s GEAR UP Program experienced a special tour of the Nevada National Security Site (NNSS). The tour, initiated by a Nevada Site Specific Advisory Board member representing Pahrump, focused on science at the NNSS. Participants visited the United States Geological Survey (USGS) Core Library in Mercury which houses more than 2 million linear feet of geologic cuttings and drilling cores, some that were retrieved from thousands of feet below the earth’s surface. Tour participants were provided a hands-on opportunity to learn about the geologic cores and examined a few up close using a microscope. The real-life lessons in science continued at the Area 5 Radioactive Waste Management Complex and U1a with discussions by scientists and other professionals with the Department of Energy’s Environmental Management Program in Nevada and the JASPER program, along with the tour’s historian (a Los Alamos National Laboratory retiree). And it wasn’t only the science that piqued the interest of participants. The NNSS tour team brought history to life during stops at Frenchman Flat, Icecap, and Sedan Crater. The USGS Core Library Manager explains how a borehole video logging tool is used to determine the condition of casing (e.g., pipe) in a water well. At Icecap, the tour’s historian, a Los Alamos National Laboratory retiree, explains the “stemming” of underground nuclear test holes thousands of feet deep. 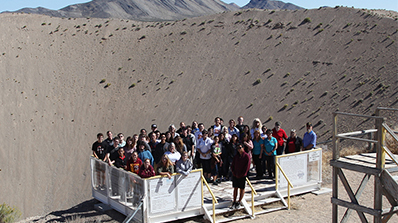 Historic Sedan Crater provided a panoramic backdrop for a group photo. 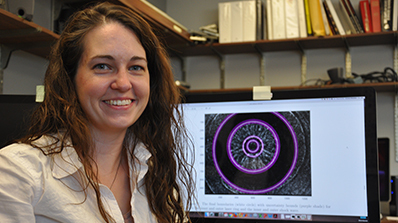 Article Co-Authored by NNSS Scientists Chosen for Journal of Applied Physics "Scilight"
NNSS Senior Scientist Marylesa Howard, article co-author, sits in front of an image of a laser-driven, cylindrically converging shock wave propagating in water, whose boundaries of varying intensities have been identified by a machine learning algorithm. An article written by NNSS Senior Scientist Marylesa Howard; Massachusetts Institute of Technology (MIT) graduate student Leora Dresselhaus-Cooper; NNSS Scientist II Margaret C. Hock; NNSS Senior Scientist B.T. Meehan; Los Alamos National Laboratory (LANL) Scientist Kyle J. Ramos; LANL R&D Scientist Cindy A. Bolme; Richard L. Sandberg, Director’s Postdoctoral Fellow with LANL; and MIT Chemistry Professor Keith A. Nelson, “Machine learning to analyze images of shocked materials for precise and accurate measurements,” was highlighted online in a physics-based review: Scilight (science highlight). Recommended by “Journal of Applied Physics” editors, and written by professional science writers, Scilights can be accessed via the Collections dropdown menu on the JAP homepage.